The popular regions of Italy, such as Tuscany are popular for good reasons. But if you travel a lot in Italy, as we do, you discover more gems than the travel magazines can give you. One such place is Le Marche, located on the Adriatic side of the boot, just about halfway up. The resemblances to neighboring Umbria and Tuscany are clear, but without the tourist crowds. If you are hearing more Italian than anything else, you are likely getting a more authentic experience. If you are looking something other than the crowds and chaos of Florence, then think about coming here. We have traveled a bit in Le Marche ourselves and you can see some very interesting vacation rentals here. From most of them you can easily take a day trip to the sea, or you can visit some of the wonderful hill towns, such as Urbino, Camerino, Macerata or Jesi. 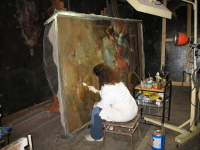 In Urbino, we came upon an open door, and inside was an art restoration specialist working on a very old painting. This entry was posted in Le Marche and tagged Adriatic, Camerino, Italy, Jesi, Le Marche, Macerata, Urbino. Bookmark the permalink.